(Seychelles News Agency) - Seychellois researchers will now have a platform to share their findings thanks to a journal launched by the University of Seychelles (UniSey) recently. 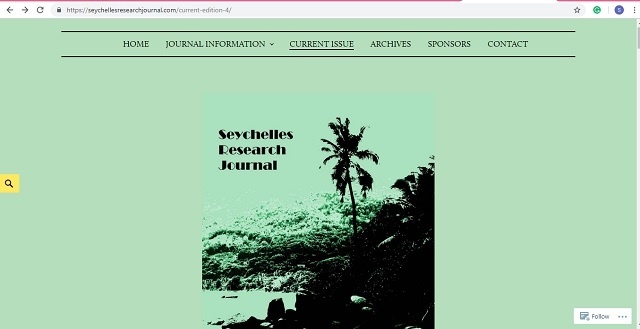 The Seychelles Research Journal is an online publication that will come out twice a year, in February and August. The journal succeeds an early UniSey publication -- Island Studies: Indian Ocean -- an attractive, hard-copy version. “The other objective is for Seychellois researchers to show what they are doing. Data and information can be used by other countries and scholars for references,” added Hardy. The journal is a platform to disseminate findings of researches undertaken locally or reported at conferences or other events in Seychelles. It will also publish other articles about the 115-island nation in the western Indian Ocean and the immediate region. The journal contains scholarly articles on various topics. The general reader can also find interest in the journal as it contains an interview in each issue with the leading researcher and reports of local and international conferences. Seychellois scientist Conrad Shamlaye known internationally for his studies, including the Seychelles child development study, is featured in the first issue. A collection of articles drawn from a colloquium at the university organised by Justin Valentin, UniSey Vice-Chancellor can also be found in the journal and a piece on the situation of diabetes in Seychelles authored by Raini Nailer from the Ministry of Health. Speaking to SNA, Marie-Celine Zialor, a local researcher who concentrates her research mostly on management, leadership and productivity in the organisation said that it was about time to publish something that gives researchers in Seychelles a voice. “Most of the time we make decisions based on our own opinions without getting proper information. Research gives information and this journal will help those taking decision. Hence, the decision taken will be more substantial, based on facts and data,” said Zialor. “The journal will further help to develop the culture of research among the people and scholars. Furthermore, it will enable people to do a little bit of critical thinking other than just reacting on things,” she added. With regards to conference reports, this time the journal features an account by Penda Choppy on the 16th International Creole Studies Colloquium, held at the university during the 2018 Creole Week.